The Nikon Picture Control Utility is a software program that comes bundled with Nikon ViewNX, Nikon’s picture browser. Nikon View NX is free, but you’ll have to download it (refer to the ViewNX download instructions) as it doesn’t come in the box. Click on the Quick Adjustment tab. 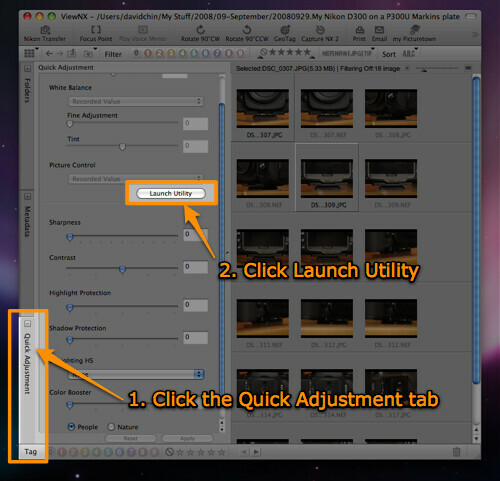 Click the Launch Utility button. If you’re on a Mac, you’ll notice an icon for Picture Control Utility in the Dock. 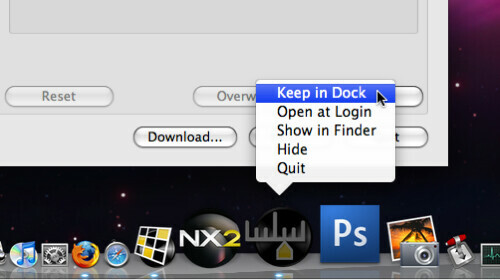 Right-click on this icon and choose Keep in Dock so that the icon stays in your dock permanently even after you have quit from the utility. The next time you want to launch this software, just click this icon — you don’t have to launch ViewNX first. Select an existing picture control, say [SD] Standard. 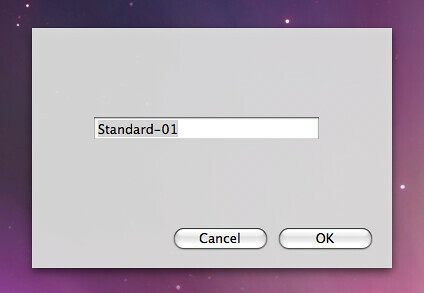 A dialog box will pop up, asking you to enter a name for the new picture control. Enter a meaningful name that helps you remember what the new curve will do for your photographs. Using my case as an example, I named it SD(0) to denote that the new curve is based on the Standard curve, but with zero adjustments. Ensure your new curve is selected in the list of Stored Picture Controls. Click on the Use Custom Curve radio button, but before you do this, have a look at the preview image in the lower left hand section. You’ll notice that as soon as you click on this radio button, the preview image becomes slightly darker, more saturated and has more contrast in the brighter colors. You are now ready to test the effect your new curve has on your RAW / NEF image files. First, you can export the curve to your Nikon digital SLR camera (Nikon D300, D3 or newer) and shoot some new photos with it. The curves that you export and implement in your camera will affect the tonality and color saturation RAW and JPEG / TIFF files, among others. 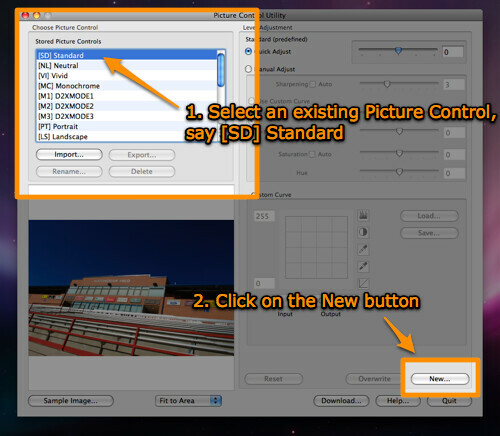 Secondly, you can open up an existing image in Nikon Capture NX and select the picture control you have just created. 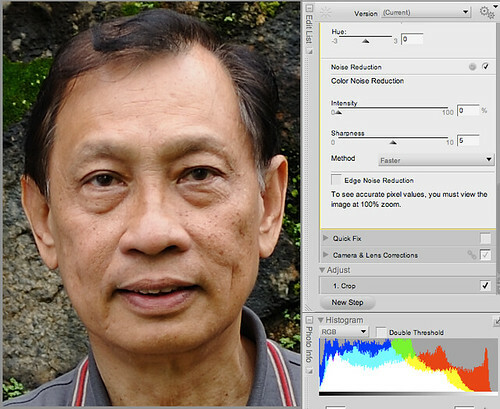 I have an example that uses Nikon Capture NX 2. 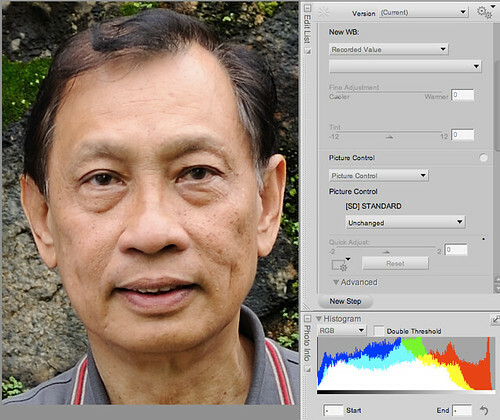 The first image is a 100% crop from a Nikon D3X NEF file. The photo was shot with the Standard curve, and Sharpening of 5. All other settings were left at their defaults, and this includes Brightness at zero. Notice how there are certain areas of skin tone on the forehead, nose and his left cheek with no detail and flat tonality. Essentially, these areas have that “blown / clipped red channel” look. For the second crop, all I did was select the SD(0) curve that I created, and look at the difference. Those same areas are no longer washed out. 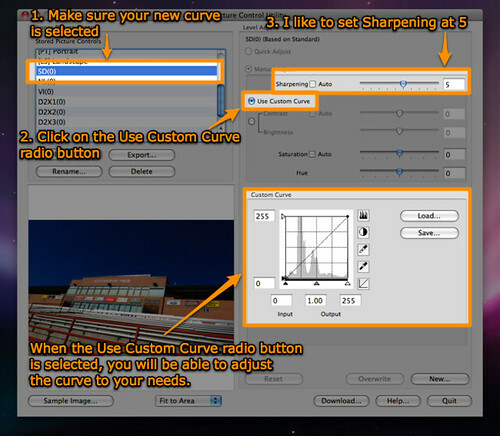 The third way is just to preview the effects of your new curve and settings within the Picture Control Utility itself. 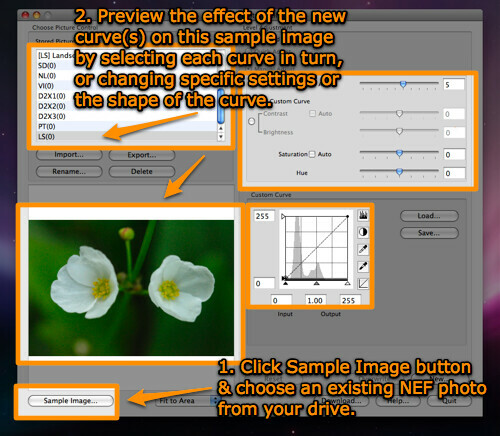 Simply click the Sample Image button, and choose any NEF photo that you wish to preview the curve with. You can then select each curve in turn, or change settings or the shape of the curve, and the chosen image will change to reflect your adjustments. 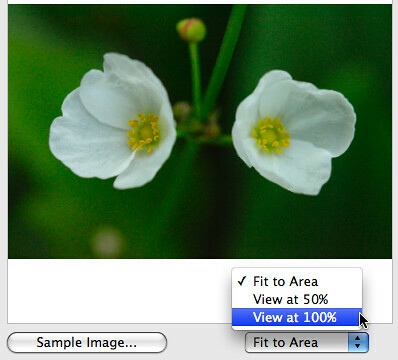 Fit to Area — this is the default, and you get to see the entire image in the preview box. What I’ve shown above is merely scratching the surface of optimal RAW processing. There are so many more variables that need to be considered, for instance, I find that photos with lots of bright, red fabrics are better dealt with in the excellent, excellent, Mac-only, RAW Photo Processor. Did I mention that RPP is free? But mastering the moves you can make in the Picture Control Utility is an important step to greater awareness of the options you have in software-based RAW conversion.